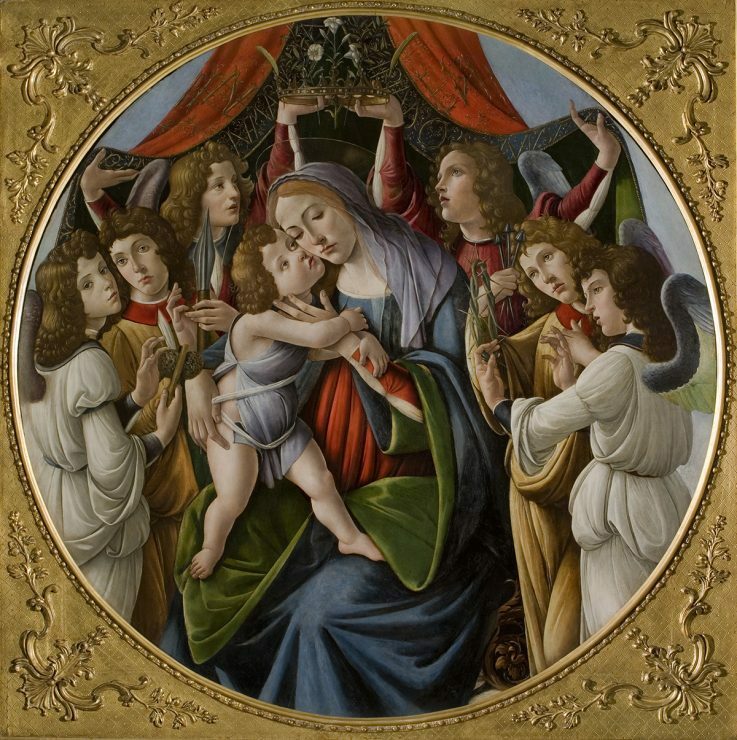 Sandro Botticelli and workshop (Italian, b. c1445, d.1510) Madonna and Child with Six Angels c1500, tempera and oil on board, 165 x 165cm (framed) 143cm (diameter) Galleria Corsini, Florence. Niccolò Codazzi (Italian, b.1642, d.1693) Architecture in the countryside, c1685-1693 oil on canvas, 93.5 x 77.5cm (framed) 67 x 53cm (unframed) Galleria Corsini, Florence. Carlo Dolci (Italian, b.1616, d.1686) Hope 1653, oil on canvas, 99 x 85cm (framed), 65 x 51cm (unframed) Galleria Corsini, Florence. 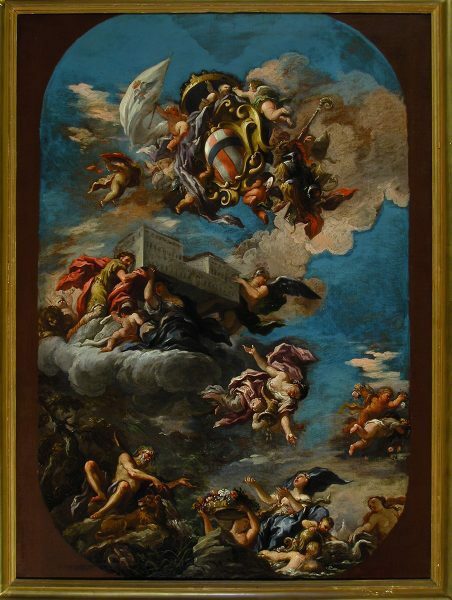 Anton Domenico Gabbiani (Italian, b.1652, d.1726), Glorification of the Corsini Family: sketch for the ceiling fresco of the Presentation Room of the Palazzo 1694-1695, oil on canvas, 129 x 100cm (framed) 116 x 86cm (unframed). Galleria Corsini, Florence. In 1650, the Corsini family started building the Palazzo Corsini in Florence, a magnificent Baroque structure that took over 70 years to complete. It was to become their residence for centuries to follow and still exists today as the Galleria Corsini, a home for their vast art collection and archives. From humble beginnings in the 12th century as sheep farmers and wool merchants, the financially astute Corsini family rose to prominence, taking up leadership positions in Florentine government, trade and banking. Their arrival in Florence coincided with the city’s blossoming as a cultural and economic hub. The Corsini collection reflects not only key moments in the family history but also those of Florence. 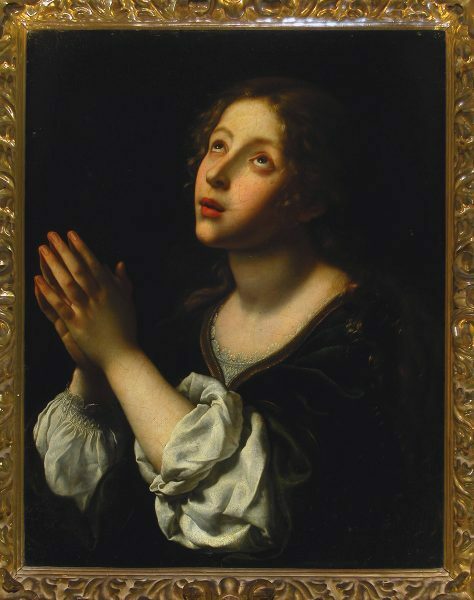 Giovan Francesco Barbieri known as Guercino, (Italian, b.1591, d.1666) Saint Andrea Corsini 1630 oil on canvas, 112.5 x 100cm (framed) 75 x 65cm (unframed) Galleria Corsini, Florence. Initially developed and curated by Mary Kisler, senior curator of the Mackelvie Collection and International Art at New Zealand’s Auckland Art Gallery, the exhibition A Window on Italy – The Corsini Collection: Masterpieces from Florence is a result of three years of intense research and international logistics. The breadth of work in the exhibition encompasses a broad slice of art history from the 14th to the 20th century and covers old masters through to contemporary photography. Botticelli, Tintoretto and Caravaggio are all represented in the collection. The exhibition’s debut at the Auckland Art Gallery late last year marked the first time Botticelli’s Madonna and Child with Six Angels (circa 1500) and Caravaggio’s Portrait of Maffeo Barberini (circa 1597) had ever been seen in New Zealand. The Art Gallery of Western Australia is the collection’s only showing in Australia. Overseen by four Corsini aunts, the collection could not leave Italy until each gave permission for the works to travel. Hoping to exhibit the Corsini collection alongside the 16th and 17th century works already in the Auckland Art Gallery permanent collection, Kisler suggested New Zealand as the initial destination. Fortuitously, it was not the first time the Corsini family had discussed New Zealand. Giovanni Martinelli (Italian, b.1600, d.1659) Music 1650, oil on canvas 108 x 88.5 cm (framed), 75 x 58 cm (unframed) Galleria Corsini, Florence. 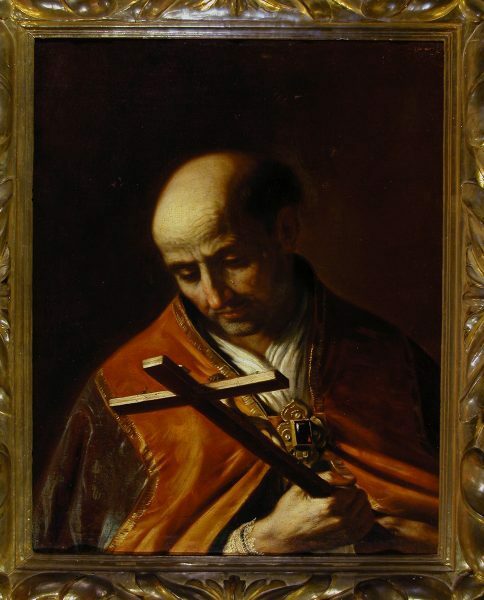 Like the contents of most family albums, there are stories behind the Corsini collection and Guercino’s portrait of Saint Andrea Corsini (1630) clearly demonstrates this. 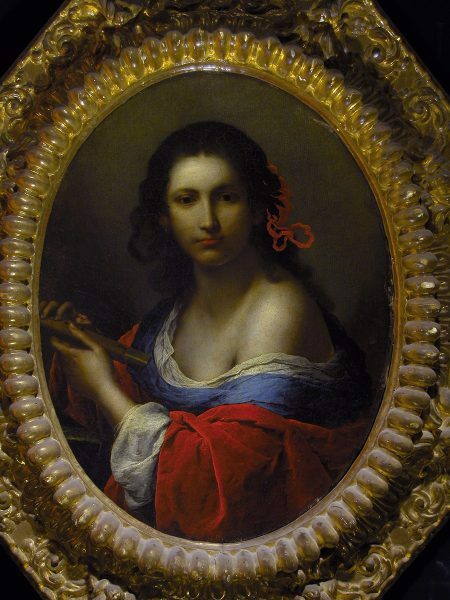 In 1944, Princess Elena Corsini saved a large portion of the family’s collection from being confiscated by the German armed forces by hastily sealing a group of artworks into a secret room. 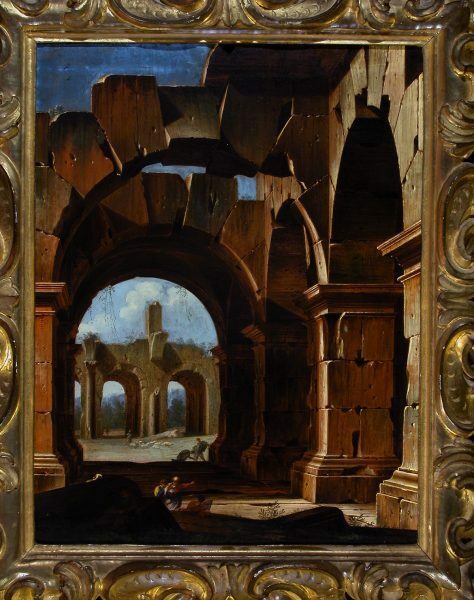 When the Germans arrived, they noticed wet plaster surrounding a false wall where Guercino’s Saint Andrea had been hung as a symbolic gesture of protection for the treasures hidden behind. Correctly assuming there were items of value behind the portrait yet short on time, the German soldiers fired shots into the painting, tearing the fabric of the portrait near the figure’s forehead. The bullet holes still remain. The exhibition is divided into eight rooms, each dedicated to a specific theme. Baroque and Renaissance art feature heavily yet there are also smaller, more intimate pieces like a dining setting used by the family, copper kitchen utensils and Antonietta Corsini’s hand-written book of recipes from 1881. A touching inclusion is an album of watercolours by Amerigo Corsini collected and bound into a book by his mother Luisa Scotto Corsini, following his unexpected death at just 18. 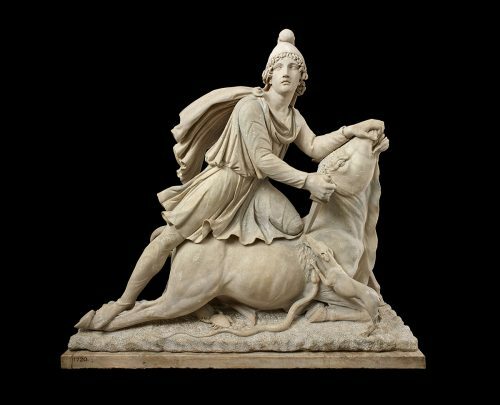 It is these items of personal significance that round out the celebrated Renaissance works and cement the fact that while the Corsini collection may originate from a grand location, it remains valuable on both a historical and personal level. This exhibition, on loan from the British Museum, has already toured to the Middle East, Japan, Taiwan and Western Australia. Now Canberra hosts this travelling exhibition that covers over 200 million years in one room.